Growing up on a farm has its advantages and disadvantages, but growing up on a farm with a waterway flowing through it is nothing but pure adventure. This waterway has a name, Ulao Creek. 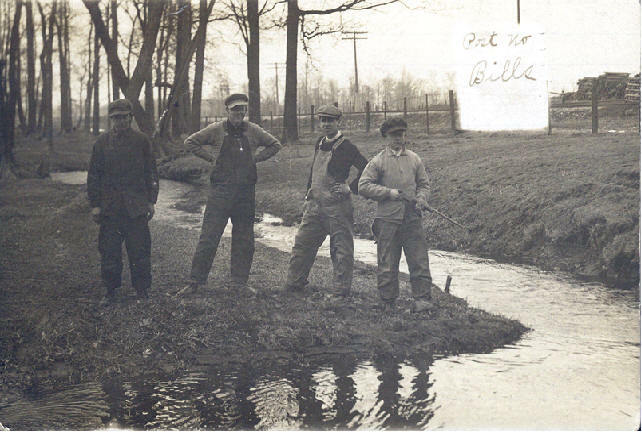 This little known creek was like a blood vein flowing through our farm for obvious reasons, but for my siblings, friends, and me, it was the source of hours of recreation. Before Playstation®, cable TV, satellite dishes, and other modern conveniences, this small, free flowing, spring fed creek offered a new adventure at every turn. When the creek flowed naturally, we knew where we could run to take a quick dip, in between loads of hay, or to wash off the itchy chaff of truckloads of oats we unloaded. On the warm spring days, we could sail our “mighty ships” made of old cedar posts and scrap wood, down the creek to a place called Ghost Town. If Mrs. Manage felt sorry for the half drowned urchins that knocked on her back door, we could all share a nickel candy bar. To sit on the railroad bridge and watch the large northern pike come up to spawn was something we didn’t understand, but it sure was fun trying to catch them any way that we could. On the neighbor’s farm to the north, where the springs bubbled, we could go and pick all of the watercress mom could use, and also bring home a bouquet of wild flowers that would make her eyes water. Those were just a few of the things that this little creek once could do. We took it all for granted. We thought it would never end. As the town grew and as we grew, this stream became a casualty of apathy, abuse, and ignorance. In 1968, I-43 needed to be constructed and so the swimming holes were paved over, replaced by a ditch and concrete culverts. With the village growing, old farms were sold and pavement was poured. Suddenly, due to runoff, the little creek would change from raging litter-strewn flood to dried up cracked ground, and then back again to raging flood waters. Farmland that once produced major crops could no longer be counted on to produce consistently. The habitat for nesting waterfowl and spawning fish could no longer be sustained due to the large fluctuation in water levels. During the 1970s and 1980s, the springs to the north would be capped or diverted so that a flyash landfill could be built. The spring pools that supported diverse plant life became stagnant and sediment laden. Reed canary grass soon took over and trapped the water, causing the trees to die from water stress. What was once a colorful lowland woods, turned into a tangle of uprooted trees and bare trunks. Approximately five years ago, a few neighbors who realized what had taken place in such a short time, got together to discuss the problem. We talked and argued, and argued and talked. We gathered whatever information was available to us and decided we had to do something, or at least try. “Necessity is the mother of invention”. With the help of local professionals and many meetings, we decided to organize and take a stand for this little creek that had quietly served so many for such a long time. Thus, the “Ulao Creek Partnership” (UCP) was formed. In future newsletters you will be informed of all the things that have been done and how you can become involved. Soon we will need volunteers to reforest and maintain their portion of the watershed. Somehow this little creek has survived the many years of neglect and abuse. Now is our chance to change that, and save what is left of this little creek that could. So before more concrete is poured and more culverts are installed, please consider becoming involved. “When many do a little, no one has to do it all.” The UCP is a 501(c)(3) nonprofit organization.